Northeast Physician Hospital Organization (NEPHO) is a corporation comprised of two owners, the New England Community Medical Group (NECoMG) and Northeast Hospital Corporation (NHC). The New England Community Medical Group (NECoMG) is an Independent Physician Association (IPA) comprised of area practicing physicians, both Primary Care and Specialty based. The physicians are shareholders of (NECoMG). Northeast Hospital Corporation, a member of the Lahey Health System (LHS), includes Beverly Hospital, Addison Gilbert Hospital, Lahey Outpatient Center, Danvers and BayRidge Hospital. 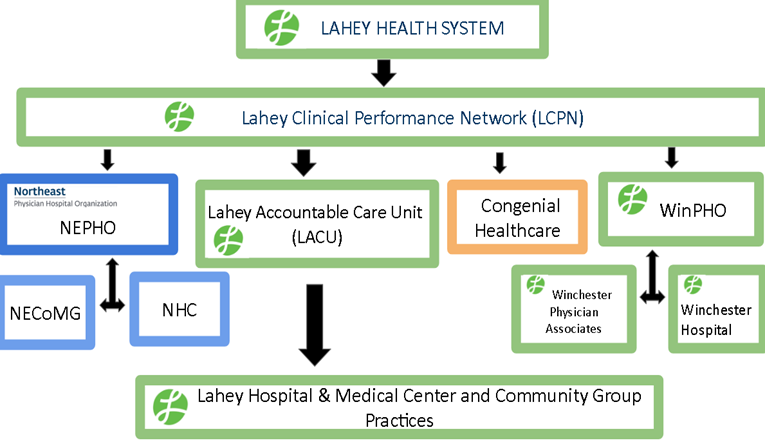 Northeast PHO is an Accountable Care Unit(ACU) within the Lahey Clinical Performance Network (LCPN). LCPN is the employed and affiliated network for LHS, which provides financial integration of managed care risk contracts, and oversees population health performance for LHS.